The Track Hanger Hook (EC Part #11141) is perfect for hanging holiday lights, planters, and decorations! These clever hooks are easy to install and neatly attach to ceiling tile track for temporary or permanent use. 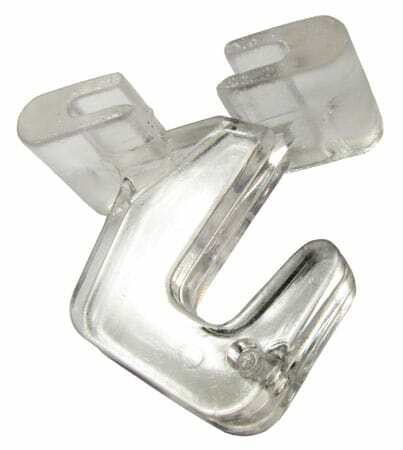 They are made of clear plastic, which gives the track hanger an invisible look. No more unsightly thumbtacks or nails! At Equiparts, we use track hanger hooks to hang banners in our showroom. Call to Order the Track Hanger Hook now at 800-442-6622 Monday-Friday, 7:30AM-5:00PM EST. Be sure to mention EC Part #11141 when placing your order. Save and or share the Track Hanger Hook PDF with your colleagues.